There have been significant efforts in providing semantic descriptions for Web services, including the approach as exemplified by OWL-S. Part of the semantic description in OWL-S is about the interaction process of the service concerned, and adopts a procedural programming style. We argue that this style of description for service interactions is not natural to publishing service behavior properties from the viewpoint of facilitating third-party service composition and analysis. 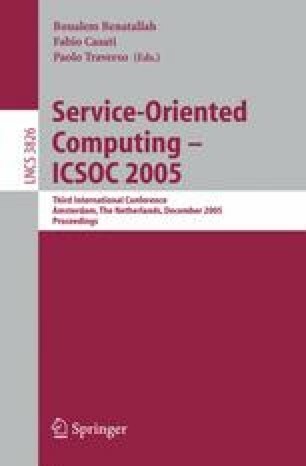 In this paper, we introduce a declarative approach that better supports the specification and use of service interaction properties in the service description and composition process. This approach uses patterns to describe the interaction behavior of a service as a set of constraints. As such, it supports the incremental description of a service’s interaction behavior from the service developer’s perspective, and the easy understanding and analysis of the interaction properties from the service user’s perspective. We also introduce a framework and tool support for monitoring and checking the conformance of the service’s run-time interactions against its specified interaction properties, to test whether the service is used properly and whether the service fulfils its behavioral obligations.